We'll say it straight and we'll say it early: the HTC TyTN II is better than the Apple iPhone. In the rampant enthusiasm for all things iPhone ( and it really is very good - Ed), people often forget one thing: how good a phone is to you depends entirely on what you want to use it for. So yes, in many respects the iPhone is at, or near, the top of the pile. It's blessed with a superb web browser, email access, Wi-Fi connectivity and all the iPod functionality you need. But as a business smartphone? Sorry, but the TyTN II leaves the iPhone at the starting blocks. A solid features list is the lifeblood of any decent smartphone. HSDPA broadband (the iPhone only supports EDGE) and Wi-Fi give it the required connectivity credentials to be a strong contender. While a comprehensive software set continues the TyTN II's heavyweight functionality . But it's the TyTN II's intriguing tilt screen mechanism that stands out on this revamped HTC model. Part of the Qwerty keyboard's slide-out functionality is the ability to angle the screen at 40 degrees to the keyboard and effectively use the TyTN II as a miniature laptop. 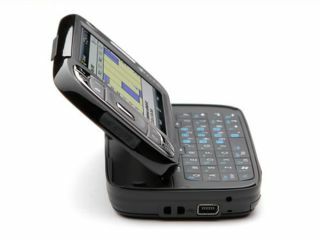 With innovative products like the HTC TyTN II and the Asus Eee around, the mobile professional has never had it so good. Of course, talk innovative phones and the iPhone comes straight to mind again, but in the business market it's the TyTN II, and not the iPhone, that's the real big hitter. Read our full review.